Presented to the NHS Trust which has worked with other public/private sector organisations, such as local government, police, fire, charities, schools etc to engage the local community in preventative campaigns. 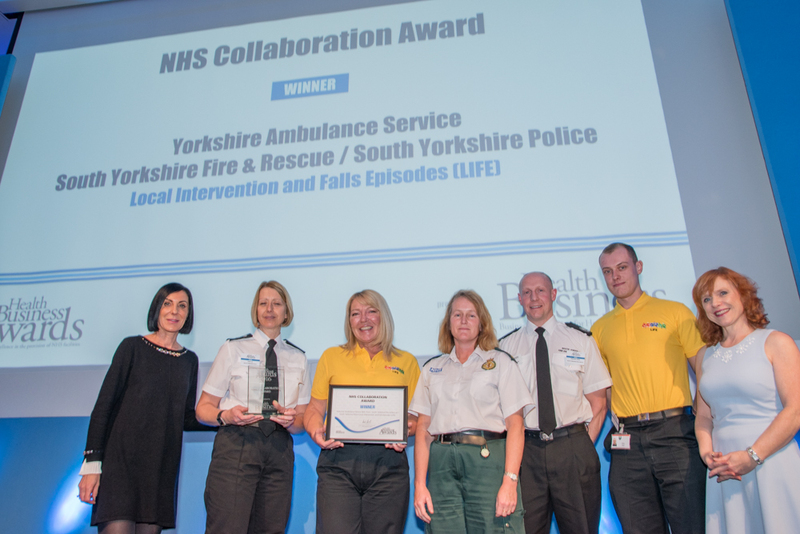 Yorkshire Ambulance Service NHS Trust has joined forces with South Yorkshire police and firefighters with the aim of reducing the demand on 999 responders. The Local Intervention and Falls Episodes (LIFE) team will attend lower priority incidents in Sheffield, seeing fire and police staff visit hundreds of homes in the city to reduce fire risk in properties, improve security and help people who have fallen and contribute to reducing the risk of falls. The team operates using two specialist vehicles and four staff - two South Yorkshire Fire & Rescue employees and two South Yorkshire Police community support officers (PCSOs). The winning collaborative project helped raise awareness of the difficulties faced by those with visual impairments. The Trust worked with the local Fire service, and the results have seen an increase in referrals and helped to maintain their independence and autonomy.